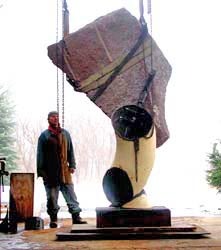 “Studio Scale” is a designation given to sculpture that can be built comfortably in Van Alstine’s current studio in Wells, NY. Unlike works that are monumental that require major equipment to move and maneuver, these “human scale” constructions allow the artist great freedom to experiment and manipulate the physical element of the works. This freedom is clearly evidenced in the wide array of unique and innovative sculpture he has created. Please explore the gallery's below.